In today’s lesson, I am going to show you three melodic rock licks from the final solo of the brand new book Melodic Rock Soloing For Guitar. The licks shown today are in the key of B minor and use the B Blues Scale (B D E F F#A) and the B Natural Minor (B C# D E F# G A) scales. This lick uses a call and response pattern. Bar one sets up the call by using a double bend at the 9th fret and bar two is the response. Bar two combines slides, legato and a double stop and uses a mixture of the B Blues scale (B D E F F# A) and the B Natural Minor scale (B C# D E F# G A). As always start off very slowly with a metronome at around 60bpm and build up to the full speed of 85bpm gradually. Double-stops can help break the pattern of only using single note licks in your soloing. The non-adjacent string double-stops shown here in this lick are built from the B Natural Minor scale (B C# D E F# G A) on the ‘D’ and the ‘G’ strings only. John Mayer is a huge fan of this idea and uses it to great effect in tracks like Belief on the album Continuum. I like to think of lick three as a ‘value for money’ style guitar lick. The rhythmic pattern is identical in both bars, and the first four notes of both phrases are the same. This lick uses the B minor pentatonic scale (B D E F# A). Watch and listen carefully to the bends and vibrato used in this lick. 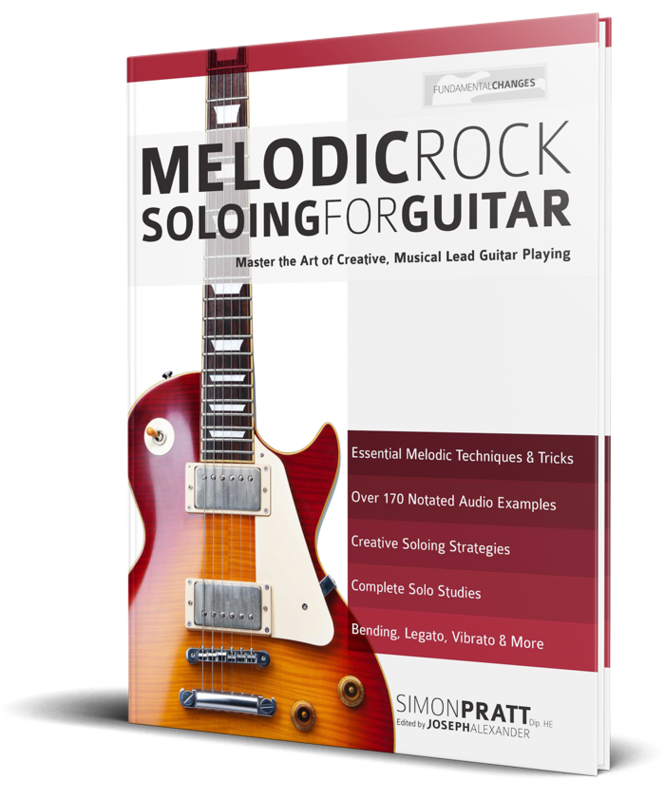 You can buy Melodic Rock Soloing for Guitar by Clicking Here.